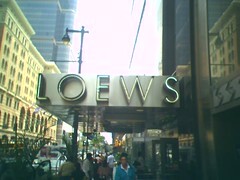 Of the Pennsylvania Convention Center Hotels, The Loews Hotel at 12th and Market Streets, is the most famous. A skyscraper visible on the Philadelphia skyline, it was once a banking building, that was converted into a luxury hotel in the 1990s. If you look closely on the left side of the photo, you can see the coffee-colored Reading Terminal Headhouse Facade, across Market Street. Is It the Philadelphia Convention Center, or the Pennsylvania Convention Center? Or Are They Two Different Places? Officially, it is the Pennsylvania Convention Center - the main reason being that the Commonwealth of Pennsylvania funded the project, back in the early 1990s. And one stipulation was that it had to be officially titled, "Pennsylvania", rather than "Philadelphia"". However, it's the only one in town, and if you just ask, "Where's the Convention Center? ", most Philadelphians will know. Should I Stay At One of the Pennsylvania Convention Center Hotels - Or In a Different Area? The answer to that question is complicated. Certainly, if you are a conventioneer, we would strongly recommend that you stay in one of these hotels. In fact, preferably, if you have your first choice - we'd recommend the Marriott, given that it's directly attached to the Pennsylvania Convention Center. If you're not a conventioneer, there are some other reason for staying in one of the Pennsylvania Convention Center Hotels. There are a lot of hotels concentrated within a couple of blocks, and so there's more competition. Granted, there are few budget hotels, as this area largely caters to conventioneers. But you'll have a lot of choices here. Although they are directly adjacent to neither, Pennsylvania Convention Center hotels permit you to reach both Old City Philadelphia and the many museums of the Benjamin Franklin Parkway - the two most popular areas to visit in Philadelphia. This works out well for conventioneers, who usually are here for more than one night, as it permits them to explore both. In other words, even if you are traveling here for pleasure- the longer the amount of time you're here, the better off you are staying in a Pennsylvania Convention Center Hotel. You're within striking distance of both. Many of these hotels did not even exist, until after the Pennsylvania Convention Center opened in the early 1990s. As a result, due to their recent construction, they are relatively new, and in good condition, with high levels of amenities. Also, since their business is largely corporate and conventioneers, they maintain a high level of customer service and quality accommodations. The Hilton Garden Inn is right next to the Pennsylvania Convention Center, its chief virtue, along with its relatively low price tag. You are directly across the street from Reading Terminal Market, with its smorgasbord available on a daily basis. The one downside is that the Convention Center area is bereft of foot traffic, and it can be dark and dreary at night, after the Market closes for the day. Note: Don't confuse this one, with the other Four Points Sheraton, five blocks away at 17th and Race Streets; or with the Society Hill Sheraton in Old City. This Four Points Sheraton opened its doors in December 2008, to help meet burgeoning demand for Philadelphia hotel rooms. As a result, its brand-new facility is ultramodern - and it has a 24-hour gym. Note: On the address, nobody you ask, will know where Juniper Street is, as it's very small (despite being named after a tree!). Instead, think of it as being located at 13th and Market Streets. It's literally in the shadow of City Hall. Note: On the address, nobody you ask, will know where Penn Square is, as it's not usually used to describe the Penn Square now occupied by City Hall. Instead, think of it as being located at 13th and Market Streets. It's literally in the shadow of City Hall. Amenities are scarce in this small, 50-room property, but the price tag is low. The Hampton Inn has 250 rooms and 20 suites, and offers great value, dollar-for-dollar. It also offers complimentary breakfast outside, on its 13th Street patio, during pleasant weather. A good choice for a conventioneer, due to its proximity to the Pennsylvania Convention Center. If you are a pleasure traveler, though, the Hampton Inn is far from the hot foot traffic areas and nightlife. So you'll probably have to walk a lot (by day) and take cabs (at night) to see the tourist attractions in Old City and the Benjamin Franklin Parkway. The Pennsylvania Convention Center District, surprisingly, does not boast of much nightlife, compared to other areas of Center City. That having been said, there is a small oasis of outdoor dining and foot traffic, on a single block on Walnut Street, between 11th and 12th Streets. And if you stay at the Holiday Inn Express Midtown - which is on Walnut, between 13th and Broad Streets (the equivalent of "14th" Street) you're right down the street from it. On the 1100 block of Walnut Street, reside several pleasant establishments that enliven the area. Across the street from each other are The Irish Pub and Moriarty's, both of which we recommend on our comprehensive Guide to Philadelphia Irish Pubs - which we'd encourage you to check out, anyway - but especially if you're considering staying at the Holiday Inn Midtown. There is also Caribou Cafe, a French bistro, and the historic Walnut Street Theatre. Historical note: In October 1976, the Bicentennial year, presidential candidate Jimmy Carter debated incumbent President Gerald Ford at the theatre, in their only debate of that campaign. Between all of these places, it's an oasis in an often desolate section at night. And if you're staying at the Holiday Inn, you can just walk on down and enjoy the conviviality. Also, since your hotel is on Walnut, between 13th and Broad, you're right next to the Avenue of the Arts - (i.e., Broad Street, south of City Hall). Due to all of the performing arts venues on the Avenue of the Arts, there is also foot traffic there, too, at night. If you'd like to return to the Philadelphia Hotels Main Page, please click here. If you'd like to leave Pennsylvania Convention Center Hotels, and return to the Home Page of Enjoying Philadelphia, please click here. If You Like Our Content, Please Like Us on Facebook! Sign Up For Free E-mail Updates For Philadelphia Events! I promise to use it only to send you Enjoying Philadelphia - Events and Things To Do In the City and Region.